Like all of you, the news of the shooting in Las Vegas hit me hard. Tom Petty’s heart attack was just added sadness. I had originally planned to write a post about how to come up with a year’s worth of blog posts, but those aren’t the words that seem important right now. What seems important right now is addressing right now. I have only one answer to the question, How to write about things that really matter. And that is, honestly. Whether that loses you clients or students is another question. We live in a world where things are not easy and news travels fast. Mass shootings. Deaths of icons. Floods. Hurricanes. Neo-Nazis. Fear, hatred, and unhappiness—we are struck daily with more instances of despair than ever, because the way we document and share our world has changed. As yoga teachers, we want to heal people. We want to provide a haven. We want to unite, not divide. We want to offer respite and refuge. And, at the same time, there may be times when the world needs to be addressed, when you feel so strongly about something that expressing your thoughts is the only thing that feels true to you. And this can be scary. Because as corny as it sounds, you want to be a force for good. But I truly believe that being a force for good means identifying what is. 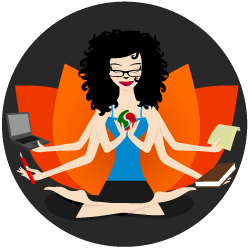 Writing, like teaching yoga, works best when it comes from your truest self and not from an idea of who you think you should be. This article is for those of you, like me, who feel the need to address current events in your yoga blog or newsletter and are a little worried about starting. How do you best speak to politics, world events, or the divide in our country in a way that holds true to the values of ahimsa, asteya, unity, and healing? First and foremost, if you are called to write a blog post or newsletter about any of this, do it. Strip yourself as bare as you comfortably can and be real. You will be amazed how far that can go, not just in building connections with your students and clients but in helping you remember who you are. There are a few things I’ve learned that help me navigate the writing when it’s about something that’s real and hard. Take them as they help you, and leave them if they don’t. 1. Write to your experience and truth, not anyone else’s. When I had a complete and unexpected terror response after the election, it took me until January to write what I needed to write, and even then I was a little wary of bringing that energy into my yoga world. But “Words of Hope and Resistance: A Post-Election Newsletter” was one of the highest open and engagement rates I ever had, on a list with a very high engagement rate—and it was fully and unabashedly about me and my experience. People respond to your truth. Tell it. 2. Write with the value / yama / ethic that matters most to you firmly in mind. 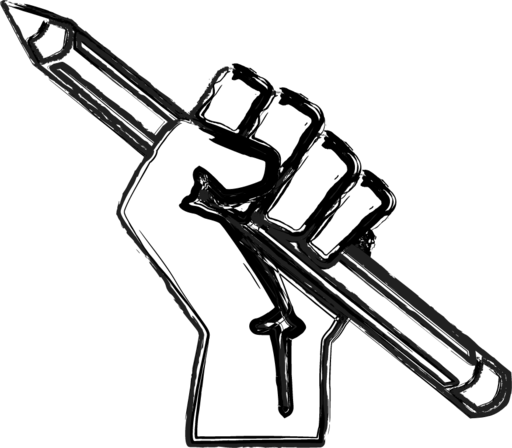 Whenever you’re uncertain if you should write something because you’re worried it might come out wrong or offend people, take a moment to remind yourself what value you care about most. Is it ahimsa? Or kindness? Or inclusion? Whatever it is, make that the touchstone for deciding what you write. Ask yourself, of every word and sentence, is this in line with my deepest value? And if it’s not, don’t write it. Writing about things that really matter, things that feel scary, is one of the best ways I know to practice living your code. Remember, though, that kindness doesn’t mean you don’t state unequivocally that certain viewpoints are unacceptable (Um…Nazis?). Understand what you care about, and understand what that value really means to you, and then use it as the foundation of everything you write. 3. Don’t publish your first draft. To be clear, this is always a good rule to follow regardless of what you’re writing! But especially with something that feels tricky or makes you uncomfortable, always let it rest for an hour or a day, and then come back and revise…unless the matter is so pressing that you have to get it out immediately. Then do what you need to do. However, I could never write the way he does…and I wouldn’t want to. It’s not at all who I am. Peace can be ferocious or quiet. Rage isn’t always unhealthy. Take your emotions, wrap them into your highest self, and then write that. 5. Stand up for what you believe and let your people find you. Don’t worry if the others fall away. I know, I know. We want to help everyone. But we can’t (yes, I hate that too). A lot of us also care that everyone likes us. But they won’t (and yes. I also hate that.). Be willing to lose some students if it comes down to that. Be willing to have some unsubscribes. Take their comments with a grain of salt and don’t feel you have to reply. Stand up for what you need to stand up for. Be bold. Show, write, and tell the world who you are so your people can find you. And if you have been true, if you have kept your fundamental value there with you as you write, then let the people who don’t resonate go. Let them fall away without sadness or judgment. Oh – and this one? It’s true for everything, not just writing. I, for one, believe that now more than ever, those of us who care about kindness and non-harming, who believe in healing the world and service, need to make our voices heard. Take your yoga to the page, and then post it or send it out. And if you want to run an idea by me, please do. Simply post in the comments. I read and respond to every one. Sign up here for free tips to help you write your book! 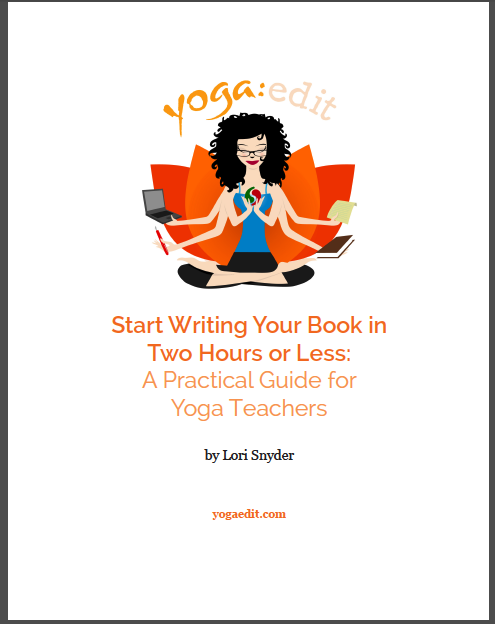 on how to start writing your book or teacher training manual!